Clients work with EPIC to optimize and improve call center operations. Here’s a sample of our recent engagements. An independent healthcare technology company was growing in leaps and bounds. With every new business acquisition, it added more toll-free phone numbers to its customer service portfolio, and each new batch of numbers was backed by a different IVR technology and support process. With disparate systems, contact center agents had to transfer callers multiple times. The result was frustration on every front—agents, physicians, payers, and members were advocating for better service. 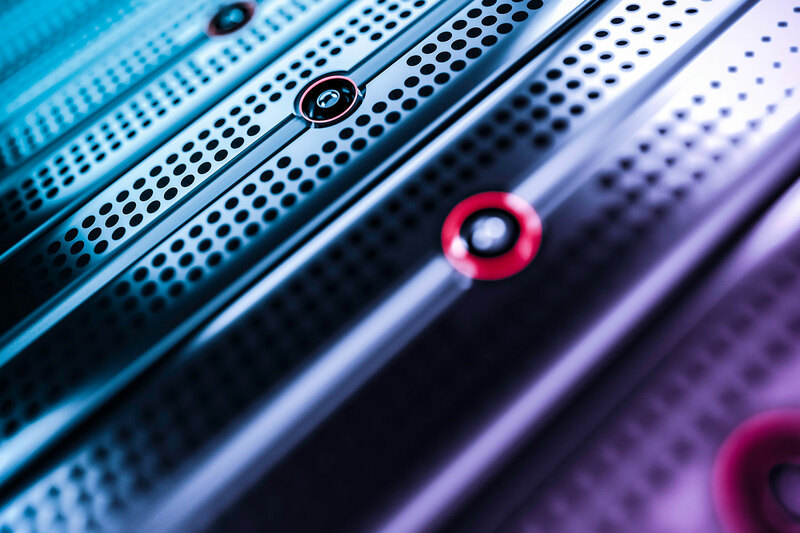 A major financial company’s self-service system was outdated and lagging behind its competitors, creating more work for both customers and contact center agents. Due to the complexity of the IVR call flows alongside the necessity of security authentication procedures, most callers were unable to access or navigate the self-service features. As a result, 98% of all calls were routed to agents for voice service. 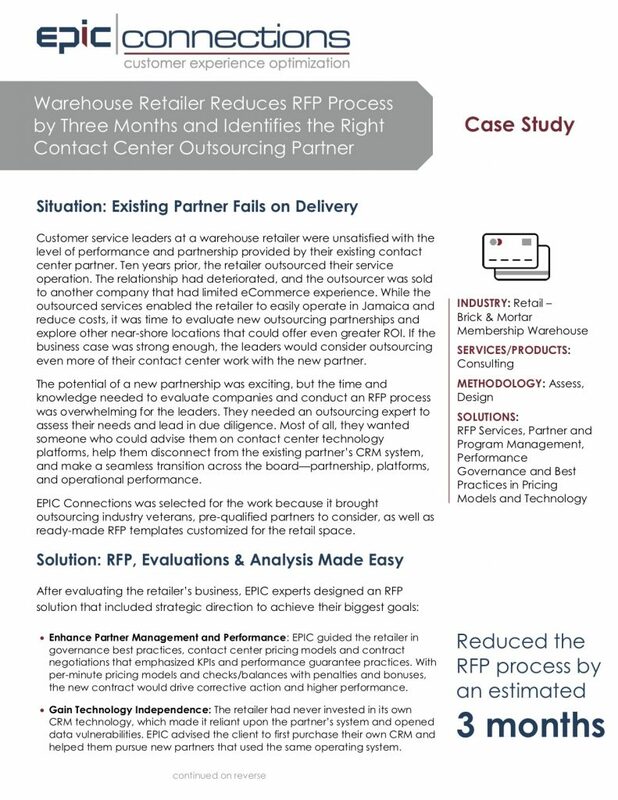 Executives at a warehouse retailer asked EPIC Connections to lead a comprehensive RFP process to procure a new partner and superior service agreement. Reducing the RFP process by three months, the retailer identified the right partner and established performance governance and pricing models to drive down the cost of service. 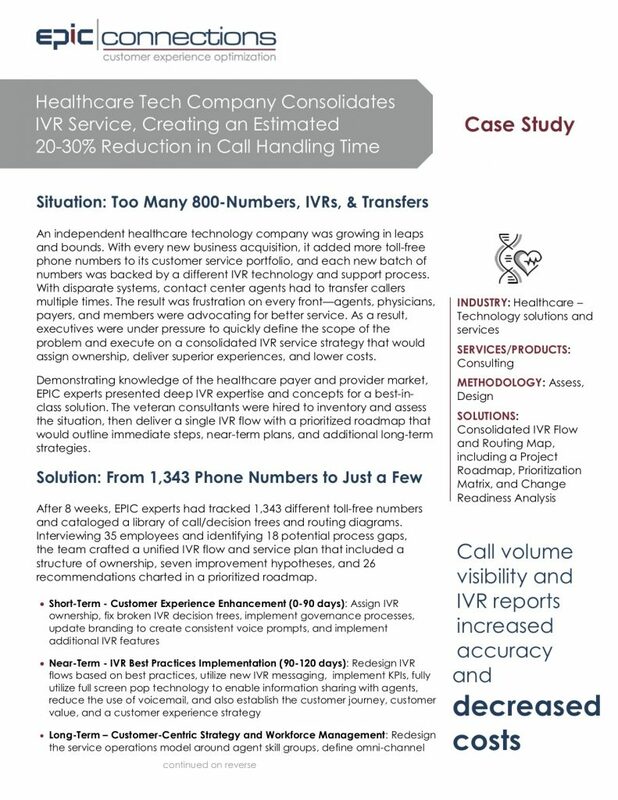 A growing healthcare technology company had accumulated too many 800-numbers and needed to consolidate various IVR systems into a single service strategy. 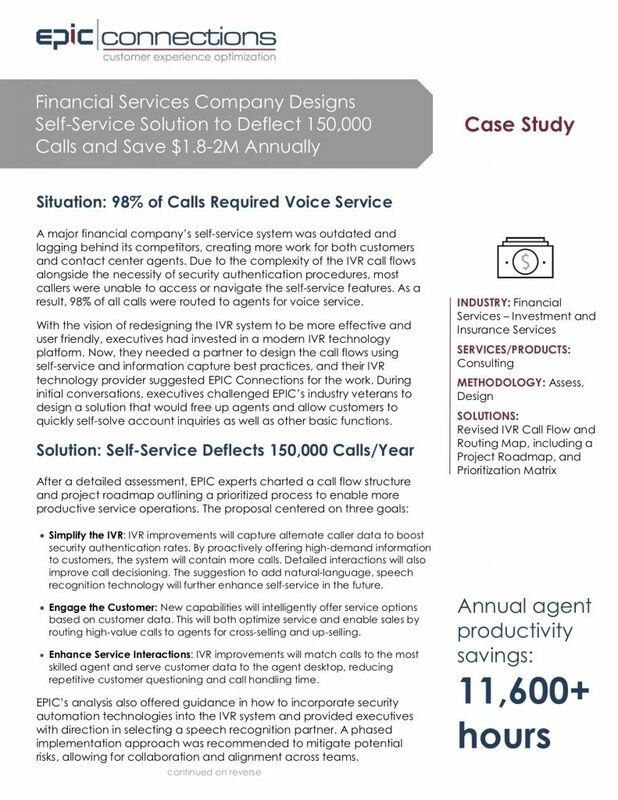 With the help of EPIC Connections, the company condensed 1,343 toll-free numbers and a library of routing diagrams into a prioritized plan that reduced call handling time by 20-30%. A regional bank and subprime auto lender struggled to add new loan accounts without also increasing the cost of their service operations. 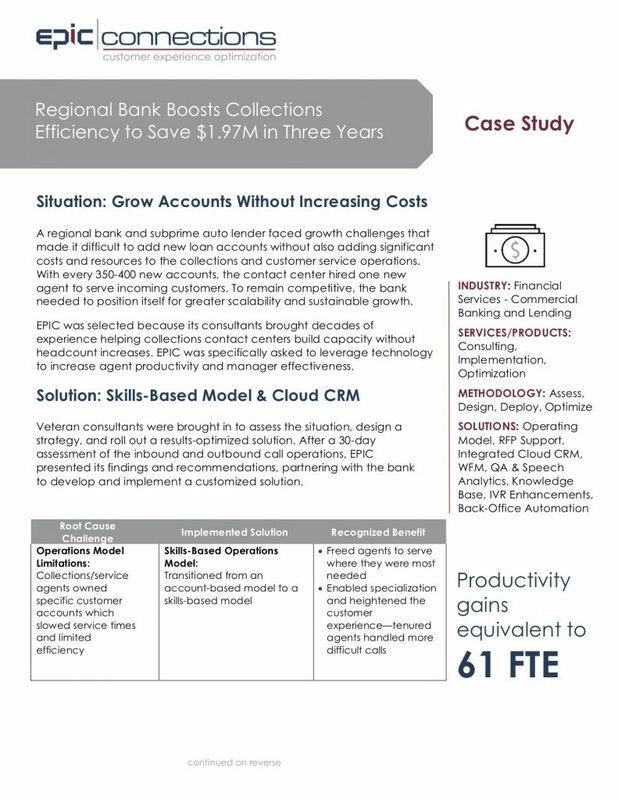 EPIC Connections implemented a skills-based service model and cloud CRM solution that produced productivity gains equivalent to 61 FTEs and created an estimated savings of $1.97M. Within 60 days, a dermatology services provider needed to consolidate customer service functions into a single contact center. 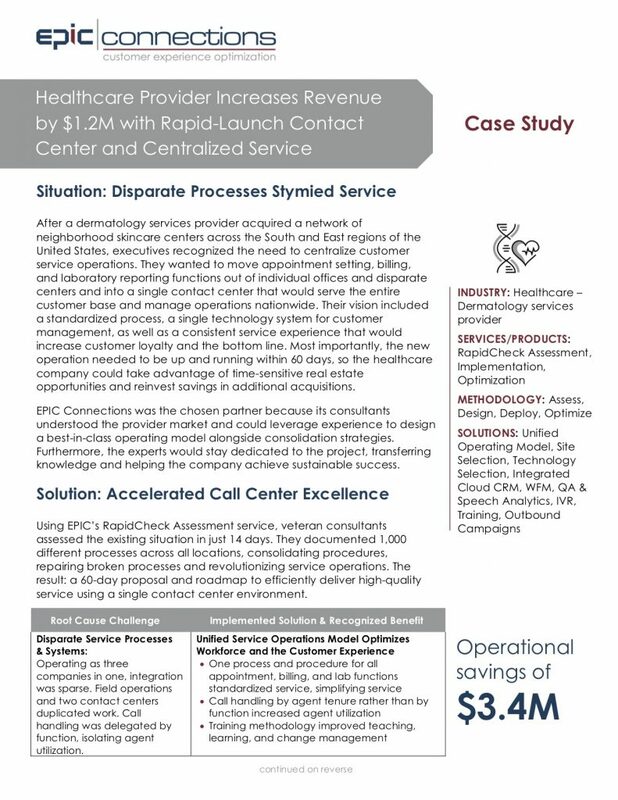 EPIC Connections combined 1,000 different processes into a unified service strategy that delivered on the deadline and produced $1.7M in patient loyalty and as well as $1.2M in revenue increases. 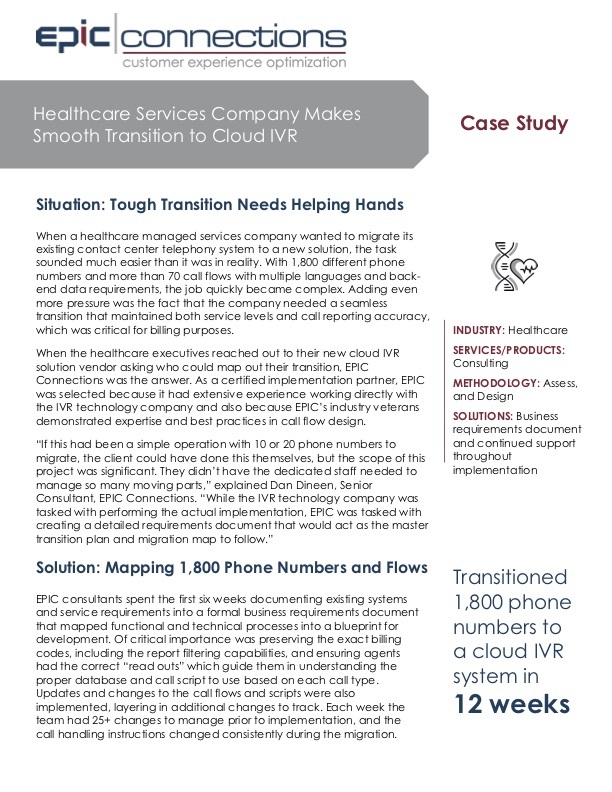 When a business process outsourcing (BPO) company wanted to break into the healthcare market, executives called on EPIC Connections to carry out their transformation. 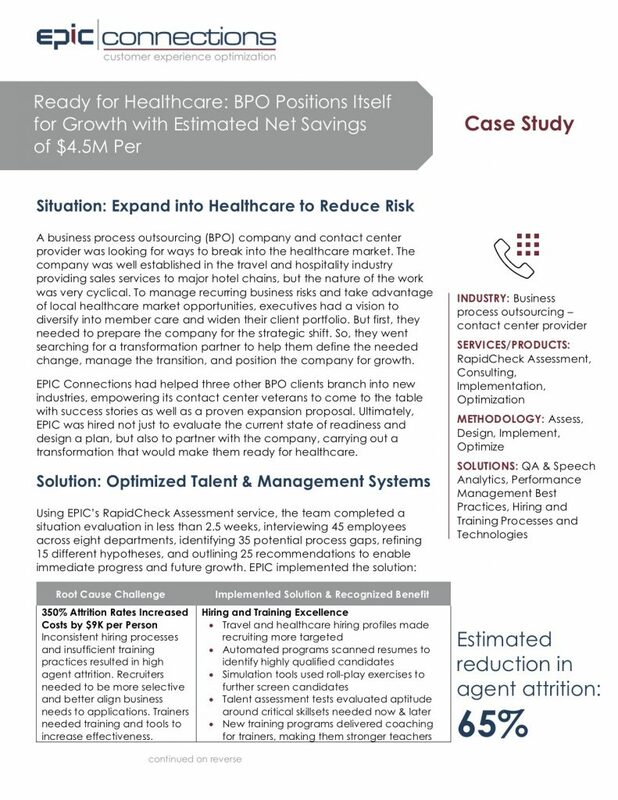 Implementing best practices in recruiting/training, performance governance, and organizational effectiveness, the BPO gained $4.5M in annual savings and a partner to help secure their first healthcare client. After the number of customer service calls doubled and created two-hour hold times, a government agency asked EPIC Connections to design a fast-acting solution roadmap. 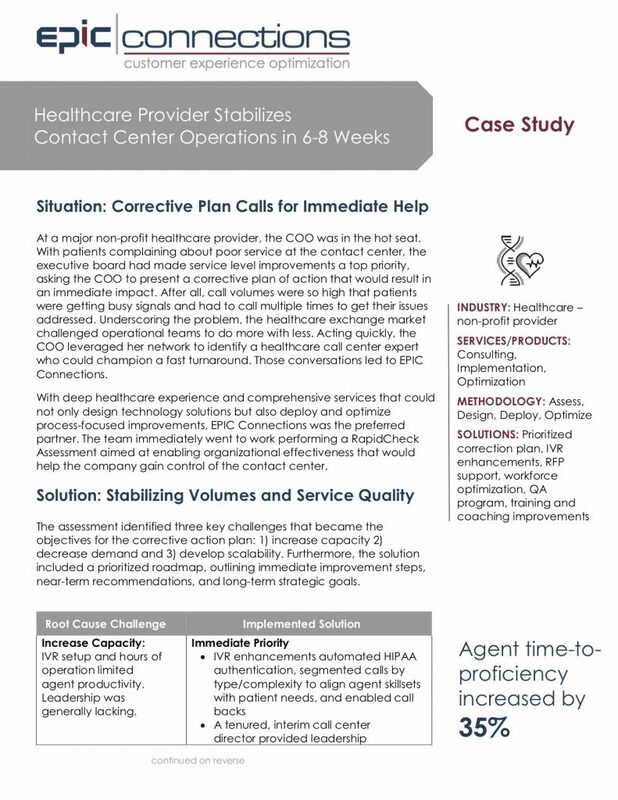 The short-term strategy leveraged IVR, process, and workforce improvements for immediate relief, while the long-term strategy outlined resources needed to reach acceptable service levels and advised how to reallocate funds to hire more service agents. At a major non-profit healthcare provider, the COO was in the hot seat. With patients complaining about poor service at the contact center, the executive board had made service level improvements a top priority, asking the COO to present a corrective plan of action that would result in an immediate impact. 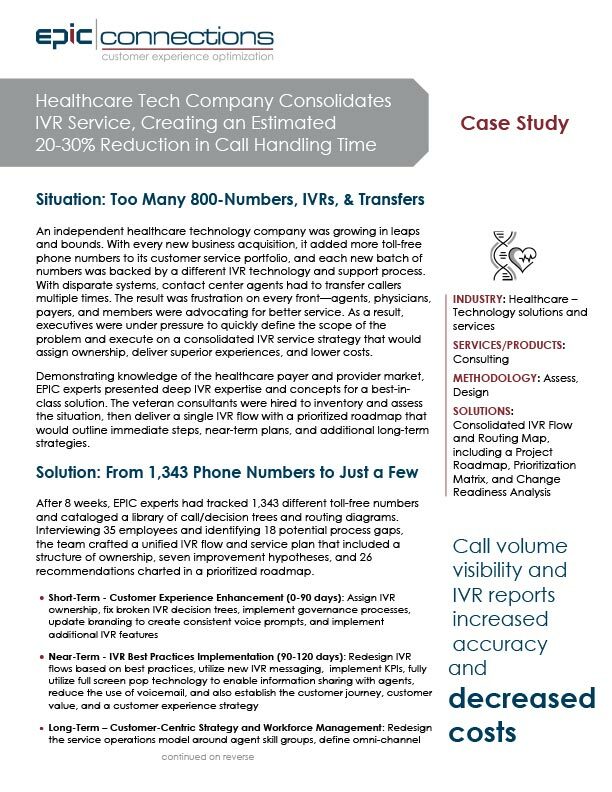 After all, call volumes were so high that patients were getting busy signals and had to call multiple times to get their issues addressed. Underscoring the problem, the healthcare exchange market challenged operational teams to do more with less. Acting quickly, the COO leveraged her network to identify a healthcare call center expert who could champion a fast turnaround. Those conversations led to EPIC Connections. 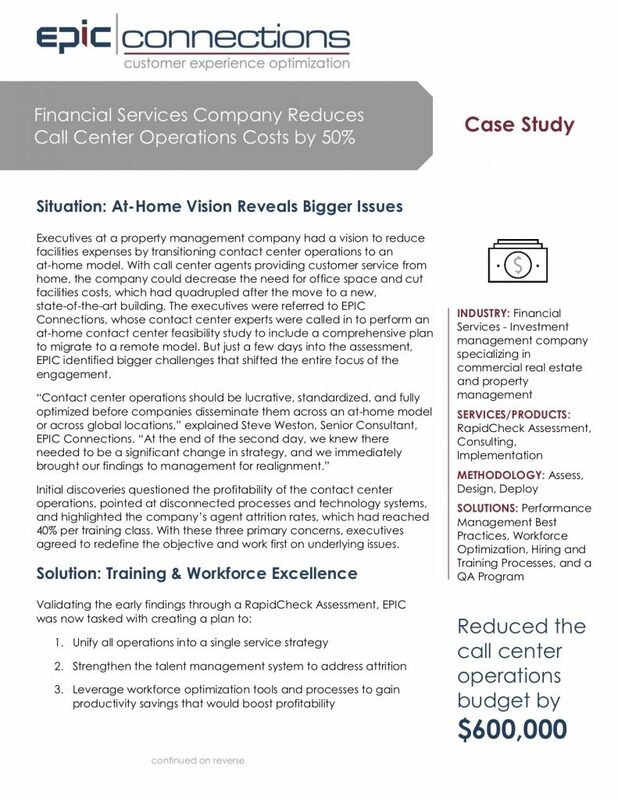 Executives at a property management company had a vision to reduce facilities expenses by transitioning contact center operations to an at-home model. With call center agents providing customer service from home, the company could decrease the need for office space and cut facilities costs, which had quadrupled after the move to a new, state-of-the-art building. The executives were referred to EPIC Connections, whose contact center experts were called in to perform an at-home contact center feasibility study to include a comprehensive plan to migrate to a remote model. But just a few days into the assessment, EPIC identified bigger challenges that shifted the entire focus of the engagement. AI is taking over the call center. Are you ready? 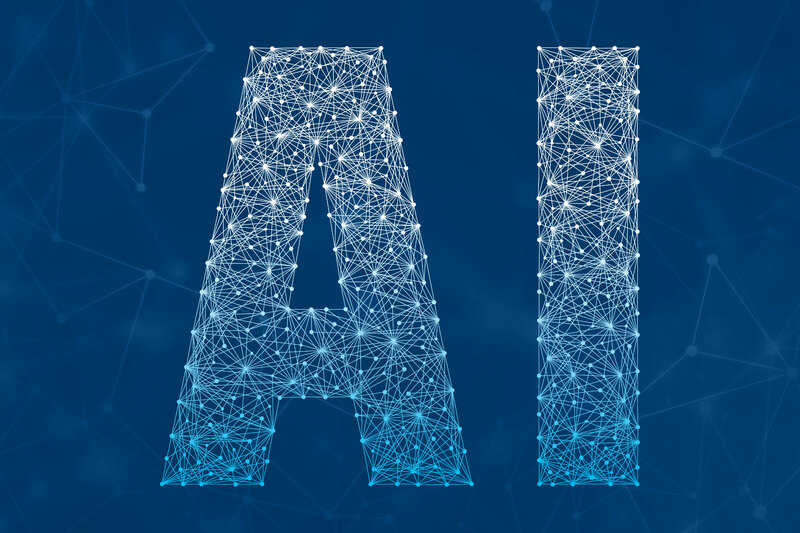 Learn everything you need to know about artificial intelligence in the Call Center: why you need it, where to use it, and how it impacts the customer experience. Creating and maintaining a good call center can be challenging, but it isn’t impossible. 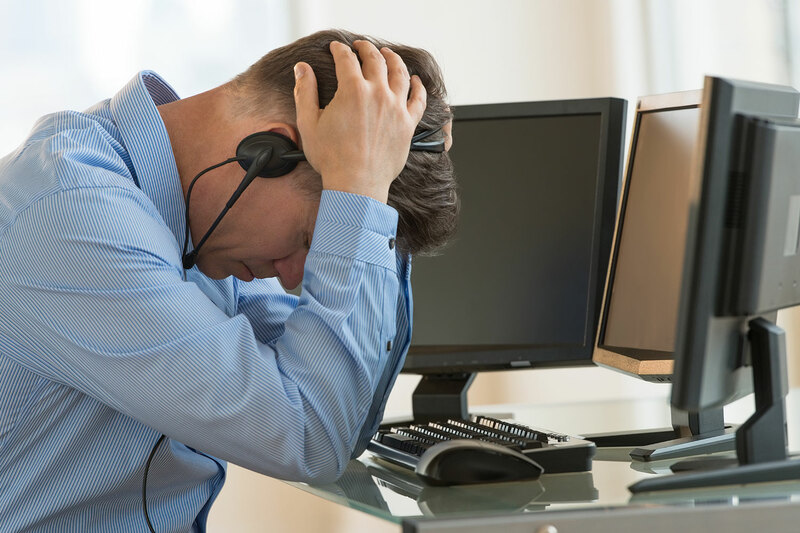 Learn to identify these top ten call center challenges to grow and improve your call center. Today’s companies are at the mercy of increasingly empowered customers who expect convenient, consistent and speedy service. They expect brands to know what they want before they ask for it. Such rapidly changing demands require the business agility to serve customers across any channel, from any place, at any time—and to make adjustments as needed—quickly and with minimum effort and resources. 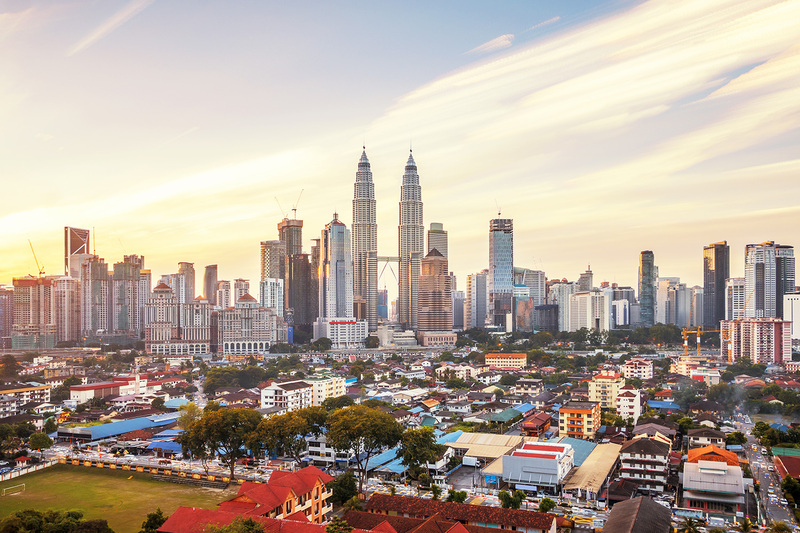 The U.S., the Caribbean, the Philippines… today’s global economy offers a world of call center location options that come with overwhelming amounts of data points for each country and city. It’s easy to get lost trying to narrow the contenders list. So, how do you effectively evaluate call center locations and select the right destination to achieve your business goals? Here are the initial preparation steps that will create a roadmap to your best-suited locations.